This Page: Ft. D.A. Russell, The Eleventh Infantry. Photo courtesy Stephen Sexton, whose father Stephen M. Sexton, a musician, is in the above photo (fourth row, third from right). As indicated on the previous page, the Eleventh Infantry returned to Fort D. A. Russell in 1904 following the Philippine Insurrection. The Eleventh Infantry was originally organized by Order of President Lincoln on May 14, 1861. Among its original field commanders was Major Frederick Steele, after whom Fort Fred Steele east of Rawlins is named. 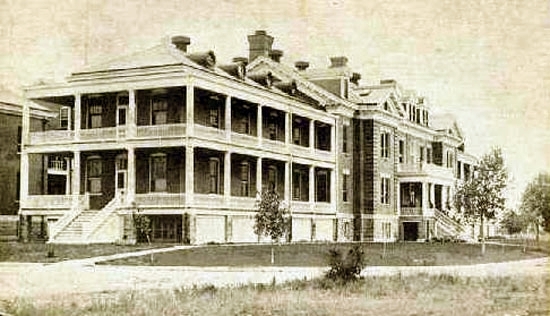 Following the Civil War, the unit was decommissioned but reorganized in 1869 and saw duty in Texas until 1876 when it was reassigned to the Department of Dakota. 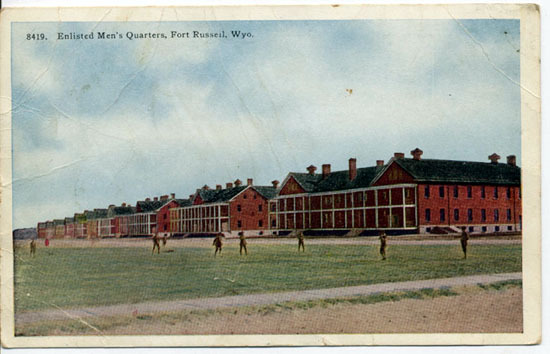 There some of its units assisted in the construction of Fort Custer, Montana. Photo courtesy Cathy Conrad, Indiana Army National Guard, Ret., whose grandfather, Sgt. 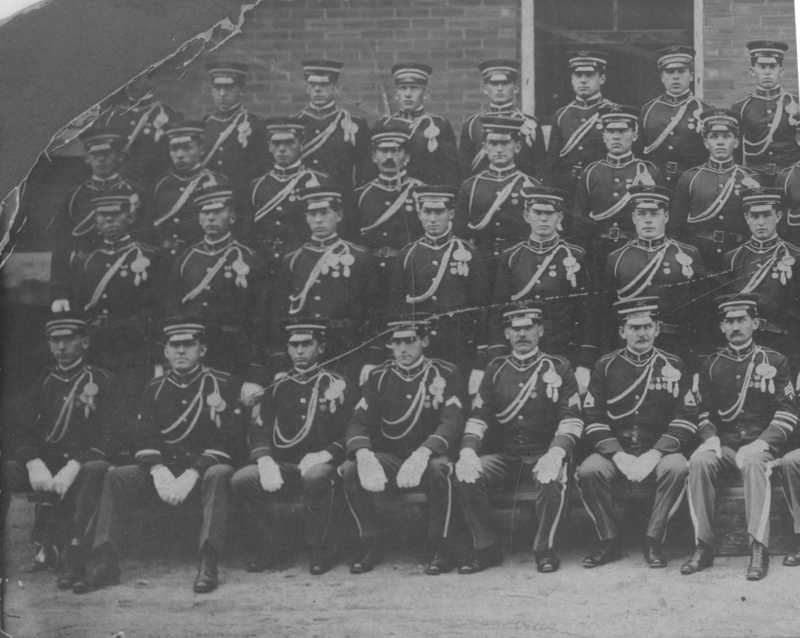 James Burton Houpt (1880-1942) is in the above photo (sixth from the right, looking slightly to the viewer's right and sitting next to the soldier who is slouching.). For full size image of left half of photo click here. For right half of photo, click here. By 1884, the Indian Wars were recognized as being essentially over. Thus, there began a program of converting the army from one intended as defending against Indian attacks to an army whose primary purpose was to defend the United States against foreign attack. Army units were concentrated along the borders of the country and at major railroad junctions. 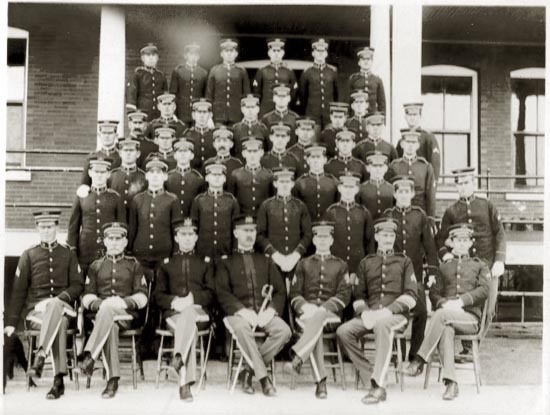 In 1887, the 11th Infantry was rotated to Madison Barracks. 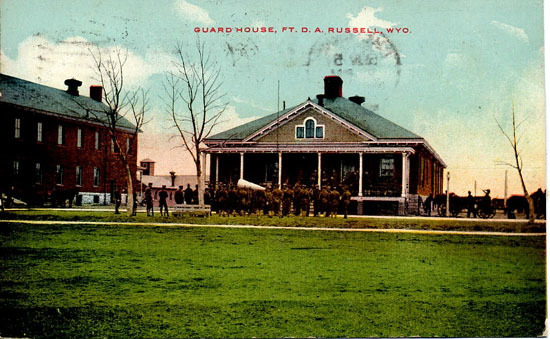 During the same period the 9th Infantry was primarily stationed at D. A. Russell and other forts in Wyoming. In 1898, War with Spain broke out. The 11th was transferred to Port Tampa for further duty in Puerto Rico where it served until 1900. With the outbreak of the Philippine Insurrection discussed on the preceding page, the 11 was transferred to the Philippines where it served first on Leyte and later at Manila. 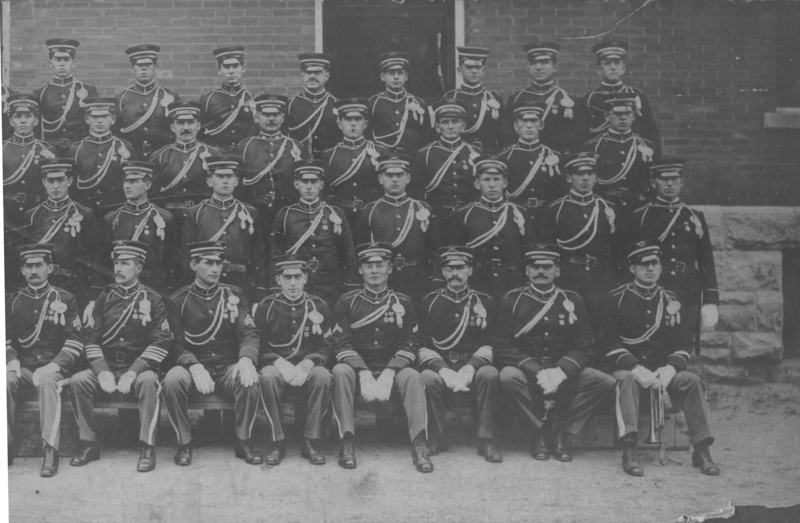 In 1904, the 11th was stationed at D. A. Russell until it was transferred to Cuba in October of 1906. 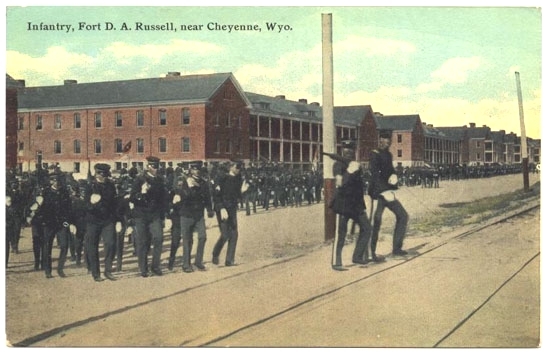 Following service in Cuba the regiment was returned to D. A. Russell where it remained primarily stationed with the exception that some troops from D. A. Russell were moved to the Mexican border in response to the revolutions in Mexico. 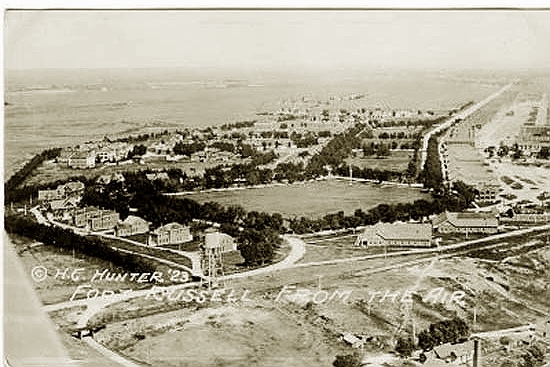 In 1930, President Hoover changed the name of Fort D. A. Russell to Fort F. E. Warren, after Congressional Medal of Honor recipient and former Governor and Senator F. E. Warren. Warren received the Medal of Honor as a result of his volunteering in an assault upon Port Hudson, Louisiana, on May 27, 1863. In the assault, Brig. General Thomas W. Sherman lost his leg to Confederate gunfire and his second in command Brig. General Neal Dow was severely wounded. In the final assault of the day, Colonel James O'Brien signalled for a charge. Less than a dozen men responded. Within 30 seconds, Colonel O'Brien was killed. It then became necessary for the Union Army to settle into a seige that lasted until July 9 when the Confederate fortifications finally fell. Contrary to popular belief, it was not the fall of Vicksburg to Grant that opened the Mississippi to Union navigation, but the fall of Port Hudson five days later. Following World War II, the Fort Warren became an Air Force Base. And the Caissons go rolling along. Fot it hi! h1! hee! That the Caissons go rolling along." Edmonun L. Gruber (1879-1941) was a graduate of West Point and served at Fort D. A. Russell from 1904 to 1906 before being assigned to the Philippines where the song was written in March 1908 at Camp Stotsenburg. The Army has since changed the lyrics and to some extent the melody. The current lyrics honor the entire Army including those who served at Valley Forge, at Litte Bighorn, the Spanish American War and World War II. Lt. Gruber ultimately became a brigadier general. Next Page, Fort D. A. Russell Target and Maneuver Range.